I like to look nice even though I live in a van. I try to get a haircut and highlights on a regular basis. Sometimes it can be a pain to find a good salon when I’m travelling. I usually find salons by looking for five star reviews on yelp or google. I thought this would be a foolproof way to get decent results. Not so. I got burned big time by this recently. I don’t want to name the salon on my blog because that’s mean. 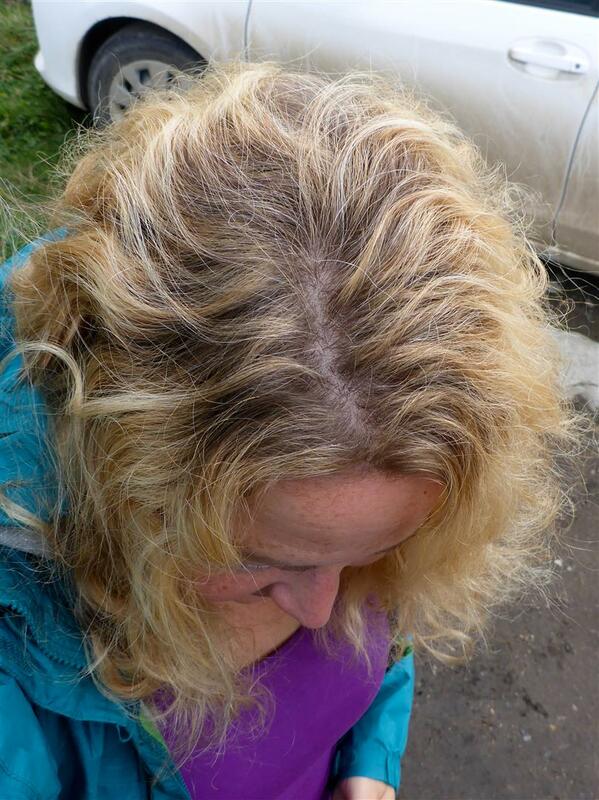 The stylist tried her best but my hair looked terrible when I left the salon. She styled my hair in a dark corner so I didn’t even see it until I was outside. Later, I called to complain and they had me come in the next morning to get it fixed. The same stylist worked on me and I looked even worse. I didn’t go back a third time. Have you ever had your hair ruined? Well, how about after spending over $100 on it? Yeah, then it hurts even more. I am fed up with random salons. My regular stylist in Boise is skilled and does a great job. Other stylists I meet out on the road are a mixed bag. A lot of them seem to not be listening. I always ask for the same thing yet wind up with very different results. The results are great only about half the time. It’s frustrating, to say the least. I’m not ready to give up. I want bright, beautiful, freshly cut hair. I just do. I’m sure this is some sick result of my societal conditioning regarding women and beauty but it’s hard to set it aside. I went to my regular stylist in Boise and asked if she would teach Brian how to highlight my hair. Luckily, she said yes! 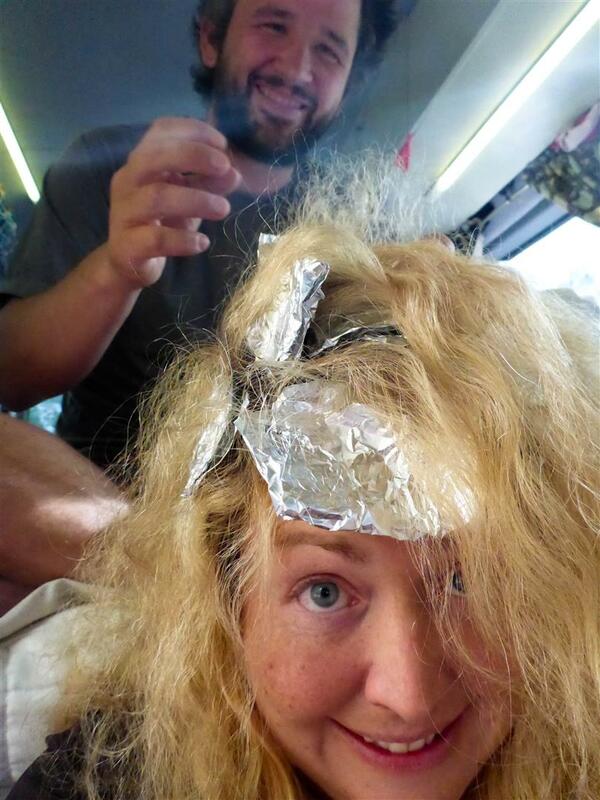 Brian took a short video and my stylist gave him detailed instructions on how to apply foils and carefully brush the thick, white paste on small sections of hair. She also gave us a bit of leftover dye and showed us how to mix it. Allowing my husband to dye my hair would be a trust building exercise. Brian was enthusiastic about trying. He’s seen how disappointed I have been after some of my salon visits. I was optimistic he could do as good a job as most salons. I promised not to be upset if it didn’t turn out well. We mixed up some dye in the van one afternoon. Brian brushed it on one thin layer of hair. We waited in suspense for 20 minutes and then washed it. It looked great! Using the right color and applying it sparingly is just as important as a cosmetology degree, apparently. Then the big day came when Brian would use up the rest of the product to add more highlights to my hair. The test strip had come out well so we felt like we could proceed with the bigger job. 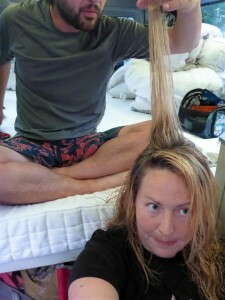 He highlighted the top layers of my hair while we sat in the van. We parked in front of the hostel in Crested Butte, Colorado for this task. They had showers there so I could wash my hair afterward. It was fast, easy and I didn’t need an appointment. My hair turned out great! I am so happy with it. By closely following instructions and using the right product we were able to get great results. I think we are onto something here! I am excited to forgo salon visits for awhile. Whenever I visit Boise I’ll see my fantastic stylist, but for regular touch-ups the van is my salon! It was a big moment: my first via ferrata. 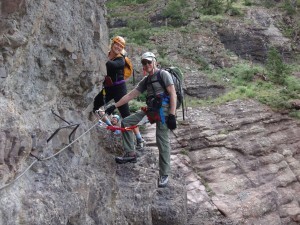 A via ferrata, or “iron road” is a protected climbing route in the mountains. This promised to be an exciting adventure. It would be a dizzying traverse across a mountainside with nothing but an iron cable affixed to the rock to keep me from falling hundreds of feet. This via ferrata, one of the top ten in the world, is in Telluride, Colorado. There are very few via ferratas in the United States. 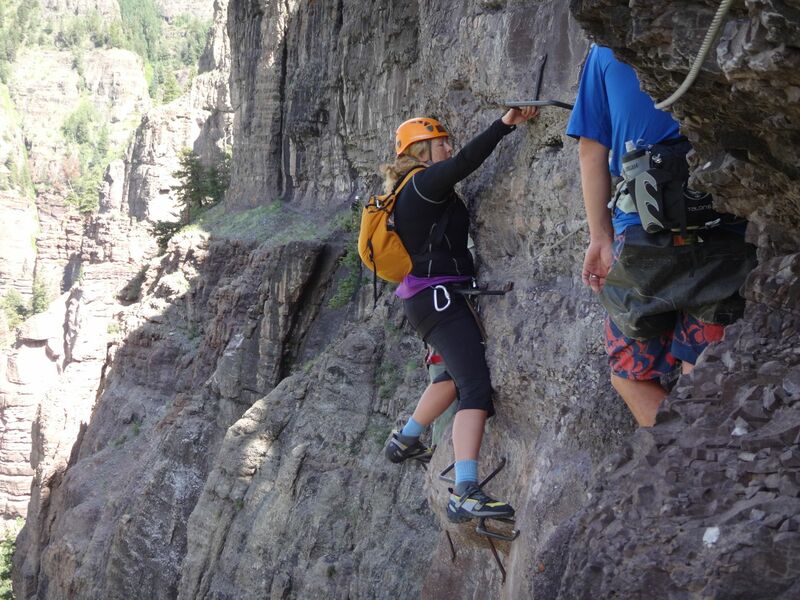 They are much more common in Europe, where they enable climbers to travel long distances through the mountains without specialized mountaineering skills and equipment. An iron cable, iron rungs, and sometimes bridges and ladders are the only protection provided in these steep and exposed places. 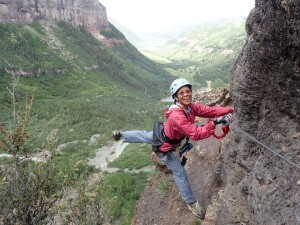 I used a special tether for the via ferrata which was designed to expand like a spring if I took a hard fall. It would prevent violent jerking at the end of my tether if I came off the rock. Two tethers were attached to my rock climbing harness, and away I went! I would also recommend a helmet and pair of gloves with a rubber palm. 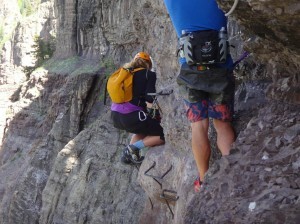 I spotted a couple people doing the via ferrata with absolutely no gear at all. Unbelievable! No harness, no tether, no helmet, no gloves, no pack. They were treating it like a hike. I couldn’t imagine! 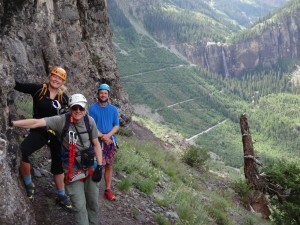 It was about 9 AM when Brian, myself and about a dozen other friends gathered on the side of a mountain in Telluride. Bridal Veil falls set the background for the via ferrata, and thick forest surrounded the tall waterfall. There was plenty of activity as everyone assembled gear and formed a colorful, excited circle. We did a little group cheer and headed up a steep and skinny trail. This trail climbed briefly and then leveled out as it traversed along the side of the mountain. 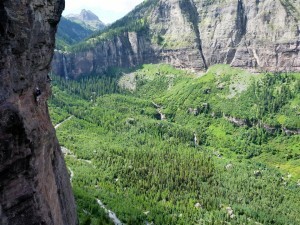 The route quickly became more exposed as it threaded its way along the side of a cliff. Anyone with a fear of heights would likely go no further, and we hadn’t even seen the portions of the via ferrata secured with an iron cable. We hiked along the well maintained and easy to follow trail. This was no stroll in the park, though. There was a drop of several hundred feet right next to it, within stumbling distance. I moved quickly but carefully, mindful of the exposure next to me but not worried about it. 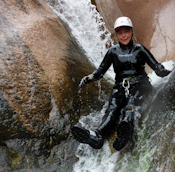 After all these years of canyoneering and big rappels I don’t have very many feelings about big drops anymore. It used to make my heart pound but now if I have a secure place to stand I feel comfortable. Soon the trail was too dangerous to hike without protection. A sharp corner lay ahead of us with sketchy footing underneath. An iron cable was attached firmly to the rocks and curved around the corner. We got our tethers ready and I noticed how exposed the footing was on this first corner, and it would only get more difficult from here. I haven’t done any climbing in a long time, am I ready for this? Sonny was in front of me and encouraged me to continue. Sonny and his wife Calius had done many via ferratas before and felt completely confident. 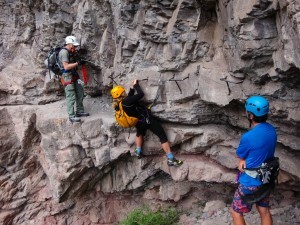 Sonny offered to stay right in front of me and Calius offered to take plenty of pictures to commemorate my first via ferrata. All photos in this post were taken by them. What great friends I have! 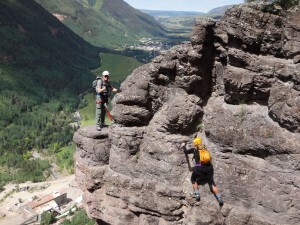 Brian was right behind me and he had done this same via ferrata a couple years ago. I felt surrounded by wonderful, supportive people and it made it easier to clip my carabiner on the iron cable, then tenuously follow Sonny around the corner. 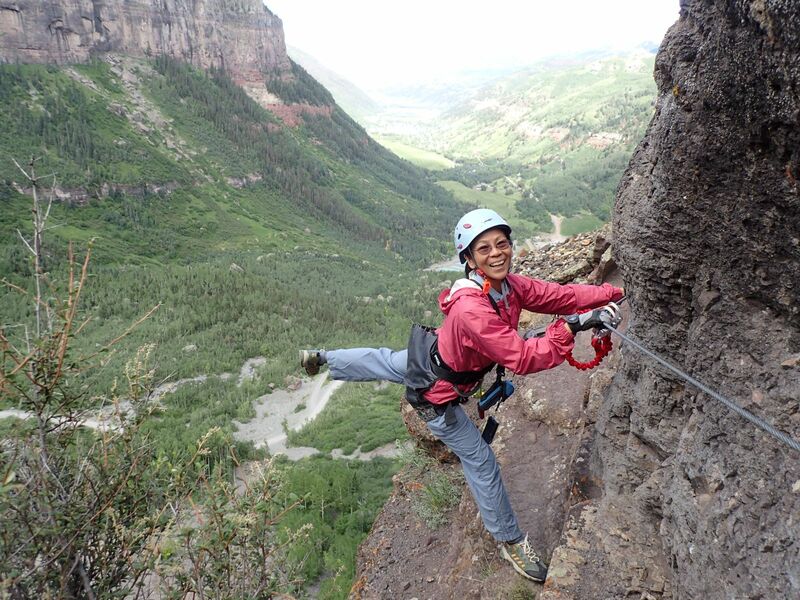 I moved along the cliff, tethered to the iron cable with my carabiner. I couldn’t help noticing there was a real risk of a fall of several feet. The iron cable didn’t feel as secure as being belayed during a rock climb, since there was usually plenty of slack in the tether. Plus, in the event of a hard fall the tether will expand by an additional foot to break the fall. 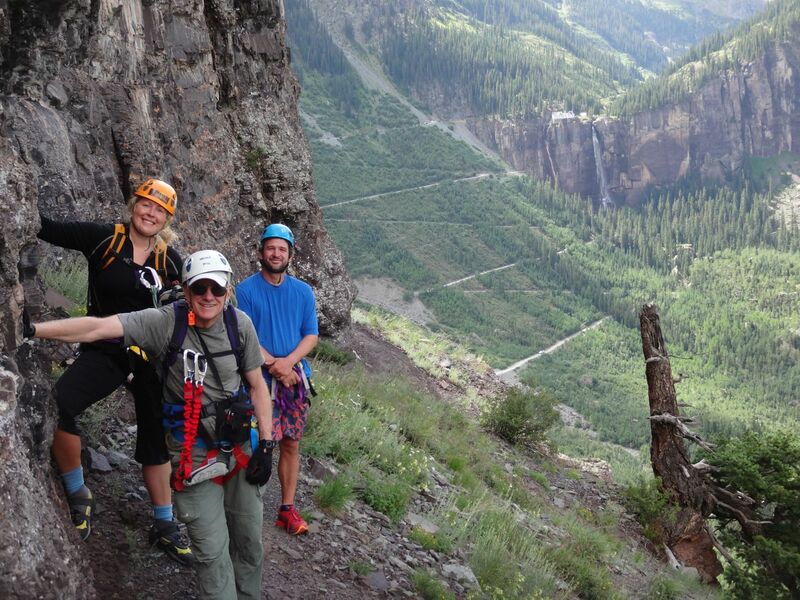 The traverse continued with big views of green trees under us and the city of Telluride far below. This was a place of incredible beauty. I was moving along quickly and enjoying the sights around me when I came around a corner and my breath caught in my throat. I had arrived at the biggest traverse on the route. I had seen pictures of it. 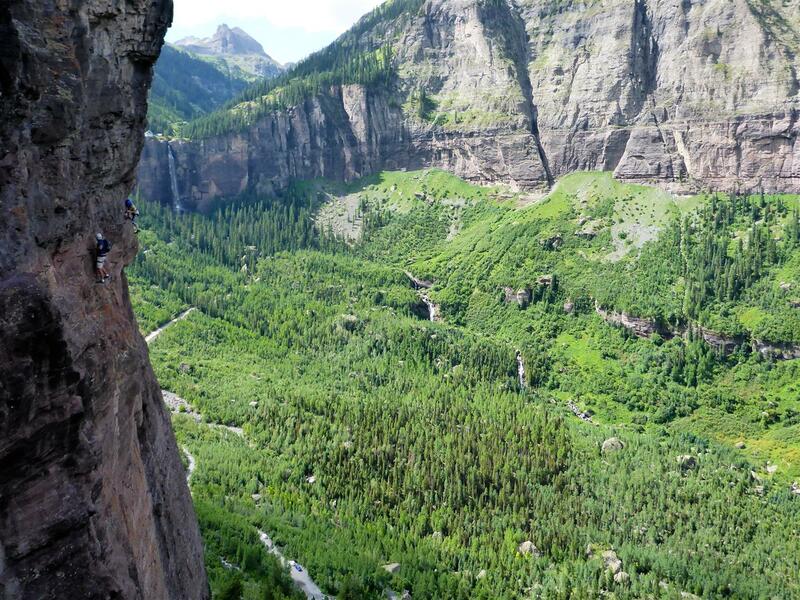 This was the spot where people clung to little metal rungs and moved across a sheer vertical rock wall a full 500 feet off the ground. Moving my tethers correctly along the iron cable here was of utmost importance, otherwise a mistake would almost certainly mean death. It’s essential to stay calm and mindful during activities like this. Every movement of the carabiner has to be right, every clip, every time. Fear only distracts you, making the experience more risky. Better to stay calm and place all focus on the gear and the process of moving it safely from cable to cable. I’ve learned to not even look down in situations like this. It doesn’t help. 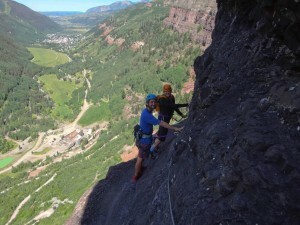 Sonny moved out onto the big wall, stepping from rung to rung, clipping and unclipping his two carabiners. Now it was my turn. I ventured out onto the first metal rung, which was secure and trustworthy. I moved over to the next rung, and using one hand moved my carabiners to the next portion of the cable and screwed the gates shut. 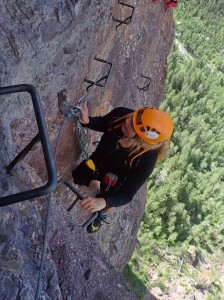 I had to grip a rung with one hand and move the carabiners with the other, all with a 500 foot void below. This was the most intense part of the experience. My heart was pounding! There were two problems. First, my palms were sweating and it made my grip on the rungs slippery. Second, these rungs were not made for tall people. A couple of them were so close together I had to scrunch my body in an awkward position to keep my feet on one rung and my hands on the other. There were no other foot or hand holds so the rungs where necessary here. I was also forced to pause in uncomfortable positions while using one hand to move my carabiners onto the next portion of the cable. I just kept moving, rung to rung, keeping my full attention fixed on my next move. Feet, hands, carabiner. Feet, hands, carabiner. Soon I was back on solid rock and the big wall was behind me. Wow, that was exciting! There was still some challenging climbing ahead of us after the big wall. 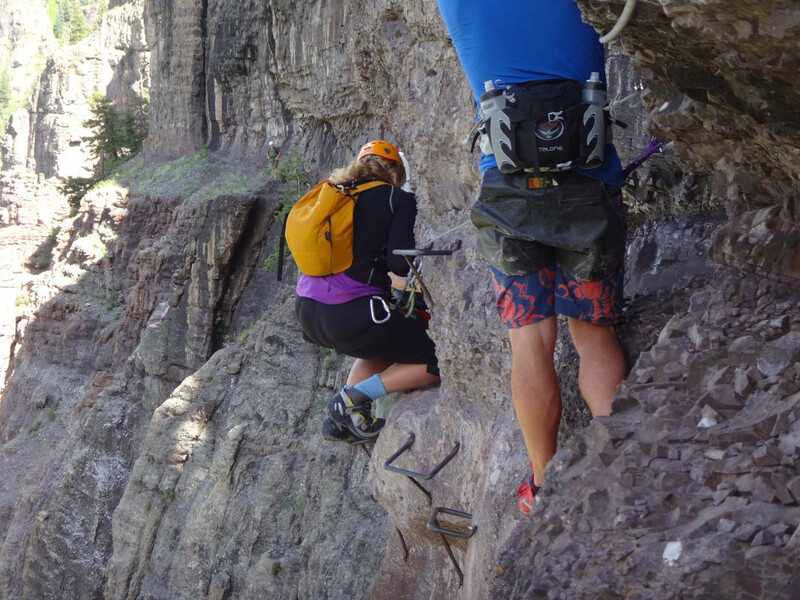 One section of the route was overhanging and required us to traverse a short distance while hanging from metal rungs using our arms. In the middle of the overhanging I had to rely on one sweaty hand to keep me on the rung as I moved the carabiner with the other hand. There were many surprises along this wonderful via ferrata, and soon we found a small tree right in the middle of the route! I put my arms around it in a loose embrace to grab the rock on either side, and felt almost as if I were dancing with it. 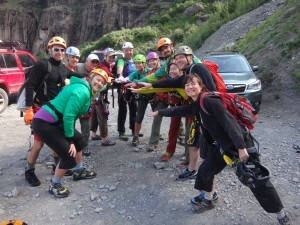 We enjoyed ourselves very much on this fun route, and felt safe and protected at all times. No one took any falls that day. 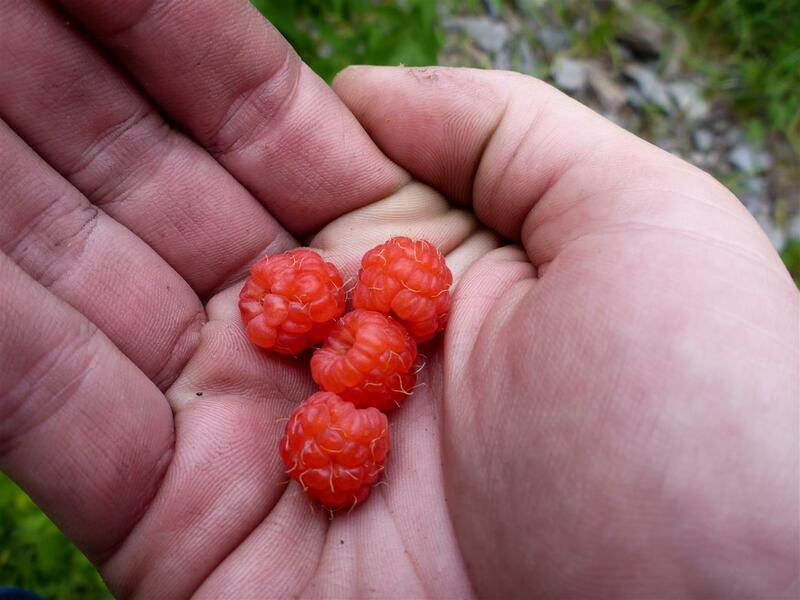 At the end of the via ferrata we found our last surprise of the day – wild raspberries! Calius and I ate many berries, Sonny ate a few, and Brian looked on with amusement. Eventually, we all headed down the mountain full of excitement over the great experience we had shared.